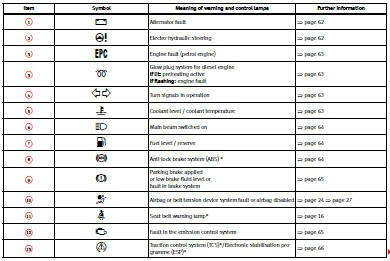 The warning lamps indicate a number of different functions and possible faults. Fig. 40 Instrument panel with warning lamps. Some of the items of equipment listed here are fitted only on certain models/model years or are optional extras. • Failure to observe warning lamps and warning messages can result in serious personal injury or damage to your vehicle. • The risk of an accident increases if your vehicle breaks down. Use a warning triangle to draw the attention of other road users to your stationary vehicle so that it does not represent a danger. • The engine compartment of any motor vehicle is a area! Before you open the bonnet to work on the engine or in the engine compartment, you must switch off the engine and allow it to cool to reduce the risk of scalding or other injuries. Read and observe the relevant warnings. • The appropriate warning lamp for a fault will light up in vehicles without warning or information texts in the display. • In vehicles with warning or information texts in the display, the appropriate warning lamp for a fault will light up and a warning or information text will also appear in the display. alternator is no longer charging the battery. You should immediately drive to the nearest qualified workshop. You should avoid using electrical equipment that is not absolutely necessary because this will drain the battery. 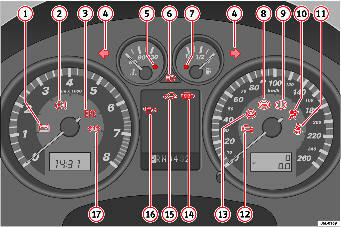 If the indicator flashes the voltage is insufficient for normal vehicle operation. The level of steering assistance depends on the vehicle speed and on the steering angle. The warning lamp should light up for a few seconds when the ignition is switched on. It should go out when the engine has started running. There is a fault in the electro-hydraulic steering system if the lamp does not go out or lights up whilst the vehicle is in motion. Take the vehicle to the Authorised Service Centre as soon as possible. When towing the vehicle with the engine stopped or due to a fault in the power steering, this will not operate. The vehicle can still be steered, but it will require greater force to turn the steering wheel. lights up when the ignition is switched on to show that the lamp is working properly. It should go out when the engine has started running. If a fault develops in the electronic engine management system while you are driving, this warning lamp will light up. Stop the vehicle and seek technical assistance. The warning lamp lights up to show that the glow plugs are preheating. It flashes if there is an engine fault. the glow plugs are preheating. When the warning lamp goes off, the engine should be started straight away. vehicle to an Authorised Service Centre as soon as possible and have the engine checked. The warning lamp flashes when the turn signals are in operation. lamps will flash at the same time when the hazard warning lights are switched on. If one turn signal fails, the warning lamp will start flashing twice as fast. Further information on the turn signals. The warning lamp lights up if the coolant temperature is too high or if the coolant level is too low. • The warning symbol does not go out again after a few seconds. emitted. This means that either the coolant level is too low or the coolant temperature is too high. First look at the coolant temperature gauge. The coolant temperature is too high if the needle is over the warning area on the dial. Stop the vehicle, switch off the engine and wait for it to cool down. Check the coolant level. If the coolant level is correct, the overheating may be caused by a malfunction of the radiator fan. Check the radiator fan fuse and have it replaced if necessary. If the warning lamp lights up again after driving on for a short distance, stop the vehicle and switch off the engine. Contact an Authorised Service Centre or a qualified workshop. Coolant level too low First look at the coolant temperature gauge. If the needle is in the normal range, top up with coolant at the earliest opportunity ⇒ . • If your vehicle is immobilised for any technical reasons, move it to a safe distance from traffic. Turn off the engine, turn on the hazard lights and place the warning triangle. • Never open the bonnet if you can see or hear steam or coolant escaping from the engine compartment. Risk of scalding. Wait until you can no longer see or hear escaping steam or coolant. • The engine compartment of any motor vehicle is a dangerous area! Before carrying out any work in the engine compartment, switch off the engine and allow it to cool down. Always note the corresponding warnings. or when the headlight flasher is operated. Further information. is given. This serves as a reminder to fill up with fuel at the earliest opportunity. A warning lamp system monitors the ABS. light up when the ignition is switched on. • The warning lamp does not go out again after a few seconds. The vehicle can still be braked in the normal way (except that the ABS control function will not function). Please take the vehicle to a qualified workshop as soon as possible. For further information on the ABS see the. If a fault occurs in the ABS, the ESP* warning lamp will also light up. , this indicates not only a fault in the ABS function, but also a possible fault in the brake system ⇒ . • Before opening the bonnet, read and observe the warnings on, “Working in the engine compartment”. check the brake fluid level in the reservoir, “Brake fluid”. If the fluid level has dropped below the “MIN” mark you must not drive on. Risk of accident. Obtain technical assistance. • If the brake fluid level is correct, the fault in the brake system may have been caused by a failure of the ABS system. This could cause the rear wheels to lock quickly when you brake. This could cause the rear to break away. Risk of skidding. Stop the vehicle and seek technical assistance. The warning lamp lights up if the handbrake is applied, if the brake fluid level falls too low or if there is a fault in the brake system. This warning lamp can light up together with the anti-lock brake system warning lamp. • If the brake warning lamp does not go out, or if it lights up when driving, the brake fluid level, “Brake fluid” in the reservoir is too low. Risk of accident. Stop the vehicle and do not drive on. Obtain technical assistance. could be out of action. This could cause the rear wheels to lock quickly when you brake. This could cause the rear to break away. Risk of skidding. Stop the vehicle and seek technical assistance. This warning lamp monitors the exhaust system. When there is misfiring that can damage the catalytic converter. Reduce speed and drive carefully to the nearest qualified workshop to have the engine checked. If a fault has developed during driving which has reduced the quality of the exhaust gas (e.g. lambda probe fault). Reduce speed and drive carefully to the nearest qualified workshop to have the engine checked. The warning lamp lights up when the ignition is switched on and should turn out after about 2 seconds. When the TCS is operating while driving, the warning lamp flashes. If the system is deactivated or if there is any fault in the same, the warning lamp will remain lit. It will also come on if a fault should occur in the ABS because the TCS operates in conjunction with the ABS. For further information see, “Brakes”. This warning lamp monitors the electronic stabilisation programme. • It will light for about 2 seconds when the ignition is switched on while a test of the function is carried out. • It flashes when the ESP is activated when driving. • It will light up continuously if the ESP is switched off. lights up and stays on after the engine is started, this may mean that the control system has temporarily switched off the ESP. In this case the ESP can be reactivated by switching the ignition off and then on again. If the warning lamp goes out, this means the system is fully functional. not deactivated, bring the vehicle to a specialised workshop to repair the fault. • Always drive according to the road weather conditions, the terrain and traffic. Driving recommendations should never lead to illegal maneouvers in surrounding traffic. Inside the key there is a chip that deactivates the electronic immobiliser automatically when the key is inserted into the ignition. The immobiliser will be activated again automatically as soon as you pull the key out of the ignition lock. The engine can, however, be started if the appropriate coded SEAT genuine key is used. The vehicle cannot be operated properly if you do not have a genuine SEAT key. This warning lamp indicates that the engine oil pressure is too low. If this warning symbol starts to flash, and is accompanied by three audible warnings, switch off the engine and check the oil level. If the oil level is too low, add more engine oil. If the symbol flashes although the oil level is correct, do not drive on. The engine must not even run at idle speed. Obtain technical assistance. This warning lamp also flashes when the turn signals are operated while towing a caravan or trailer. The warning lamp / flashes when the turn signals are operated, provided a trailer is correctly attached and connected to the vehicle. The warning lamp will not flash if one of the turn signals on the trailer fails.